Lots of us drive SUVs, but how many know just what these cars are capable of? 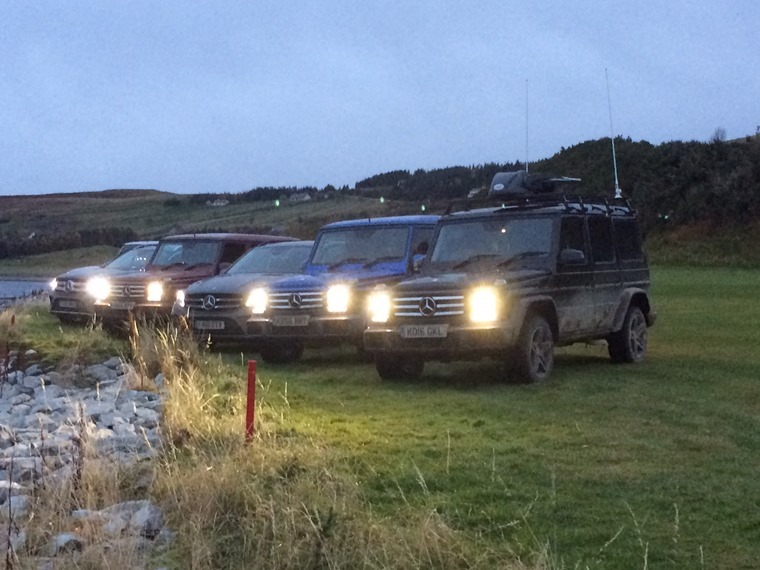 To find out, we decided to take on the toughest off-road challenge ever attempted in the UK: to drive from coast to coast across Scotland without touching a single open public road. 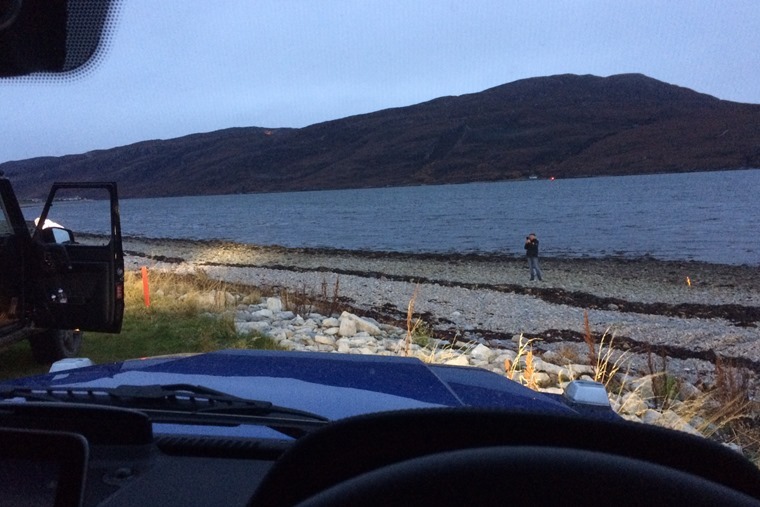 To do this required the help and cooperation of 11 different Scottish estates that linked up to create a one-off opportunity to drive from the Cromarty Firth to Ullapool. This journey will never be tried again and getting stuck during this unique adventure would cause major problems as there’s no breakdown service out here. Since 1979, the Gelandewagen has been carrying military and civilians further off-road than almost any other commercially available vehicle. 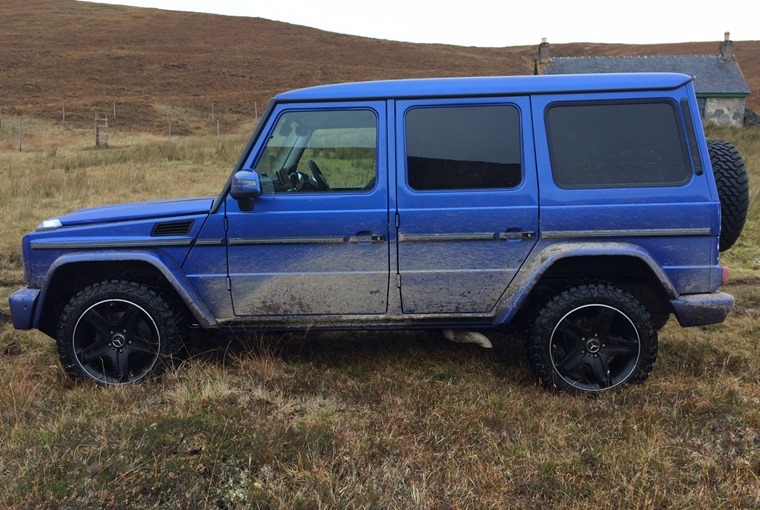 So, we’d need the right vehicle for the terrain and Mercedes came up with the ideal machine in the shape of its G-Class. Since 1979, the Gelandewagen has been carrying military and civilians further off-road than almost any other commercially available vehicle. Much like its Land Rover rival, this car is as tough as old boots, just with more comfort and reliability than a Defender. Our car was a G350d complete with Atturo Trail Blade off-road tyres. The only other change from standard spec was to remove the side-steps to create a little more ground clearance, which we were soon to find out would be absolutely necessary. Setting off from the rocky shore of the Cromarty Firth near Evanton, we wound our way up forest tracks to the Fyrish Monument. This was built in 1792 as a replica of the gates of Negapatam, it’s a folly made to provide work for farm workers suffering the effects of an economic depression. It was a welcome stopping point to take in the view and have a cuppa. So far, the G-Class had been cantering along, but now it was time for the low-range transfer ’box and the centre locking differential, one of three lockable diffs on this car. A steep descent to the floor of the glen required measured progress across slippery slabs of stone and sharp stones ready to puncture a tyre at the most inopportune moment. All of this was taken in the Mercedes’ stride and even the chill of the early morning was kept at bay thanks to heated seats and the optional heated steering wheel. 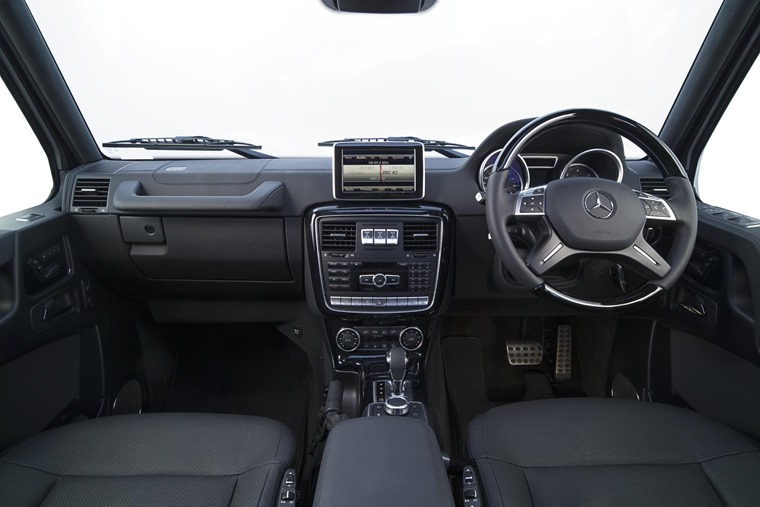 The G-Wagen may not be the last word in modern sleek cabin design, but there’s no faulting its comfort, space or practicality, and it’s kitted out with leather, touchscreen infotainment and everything you’d expect of such a premium car. Any concerns about damaging an SUV with such a hefty price tag were soon forgotten as the next natural obstacle loomed. In place of boulders, we now had deeply rutted tracks filled with momentum-sapping mud. 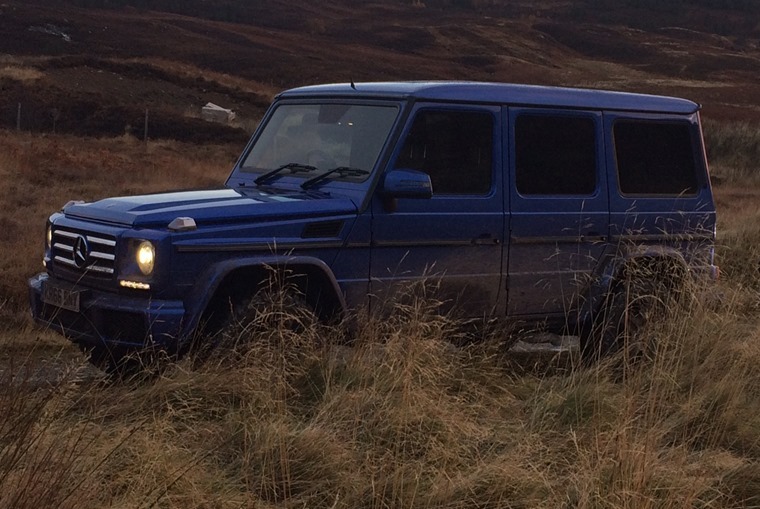 With 245hp and 600Nm of torque, keeping up a steady pace was no trouble for the G-Class. It also helps the seven-speed 7G-Tronic automatic gearbox swaps cogs seamlessly to keep forward motion going. You can also change between high- and low-ranges on the move, as well as selecting the locking diffs, so no need to risk stopping and becoming stuck. After some lunch next to the loch that supplies the water for the Dalmore Distillery, we headed into the hills towards the Alladale Wilderness Reserve, which provided our overnight stop. This estate is owned by Paul Lister and he has worked tirelessly over the past 13 years to replant the area with native species of tree to restore the Highlands to its pre-Clearances state. Part of this plan also involves re-introducing wolves and bears to the area to control the deer population. Setting off early the next morning, we saw plenty of deer on the hills as we pushed on. This started with a short section of closed tarmac road, which offered the chance to run a regularity trial against the 11 other vehicles on this trek. The aim is to cover an unknown distance at an average speed, in this case 18mph. Sounds easy, but you have to account for undulations and corners to hit that bogey speed. Thanks to my co-driver Matt’s skill, we won this extra-curricular event. Then it was back on the unmade tracks to head westwards. By mid-morning, we encountered the most serious obstacle of them all: a huge muddy bog that had turned to gloop with the overnight rain. Luckily, we had sand ladders and waffle boards to help span this mucky pit. Without these aids, the G-Class would have sunk up to its chassis in filth and shifting 2.6-tonnes of SUV would be almost impossible. A river crossing shortly after seemed like a gentle splash and it provided the chance to wash out the worst of the dirt from the wheels of the Mercedes. Thankfully, adopting a low-speed approach and letting the G-Class strut its impressive stuff meant we negotiated this tough section of the route puncture-free. After this, the terrain changed to jagged rocks and the persistent threat of punctures. With the 19-inch tyres running at lower than normal pressures to help spread the weight of the car more evenly, it also increased the chances of a deflated tyre. But manage it we did and a delicate saunter across Ullapool’s golf course allowed us to dip tyres in the west coast water to round off an incredible off-road adventure. Does it prove anything? 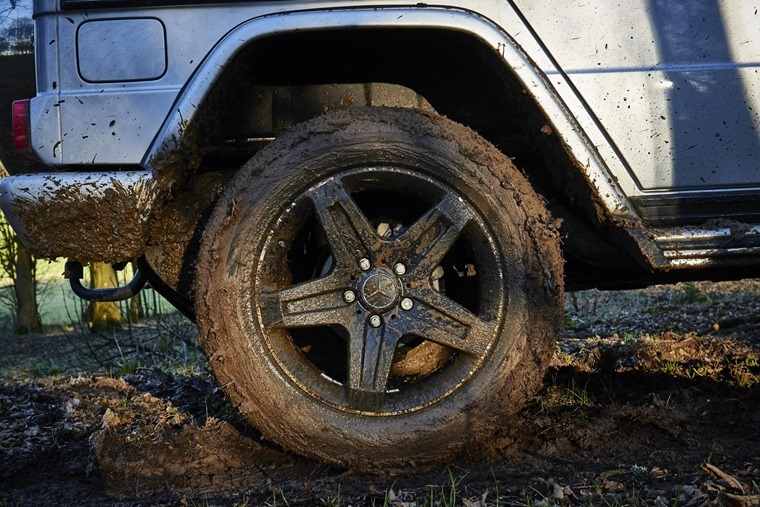 Yes, that an SUV is a lot more capable than you think it is and that a design classic like the Mercedes G-Class can still show the new kids plenty of tricks. Vaguely following Wainwright’s famous coast-to-coast walk, we took Italy’s answer to the Jaguar XF from one side of northern England to the other.